Hello everyone! Sorry I haven’t posted in a very long time, I sort of stopped with the whole blogging thing as I hadn’t got any new beauty products or had any super great ideas. However, I am determined to get back into it! So I do apologies to anyone who actually reads my blog! Today I am doing a July favourites, these are probably my favourite posts to do and I love seeing what everyone elses favourites are, so lets get into it! The first two things are the new BarryM Gelly Nail Paint colours in the colours Sugar Apple and Pomegranate. Sugar Apple is such a gorgeous colour, especially for the summer. Its a pastel blue/green colour, and of course as its a gelly, stays on so well and doesn’t really require a top coat. Pomegranate is also such a lovely colour, I think it would be perfect for both summer and autumn/winter as its quite a dark colour. Would definitely recommend these two! 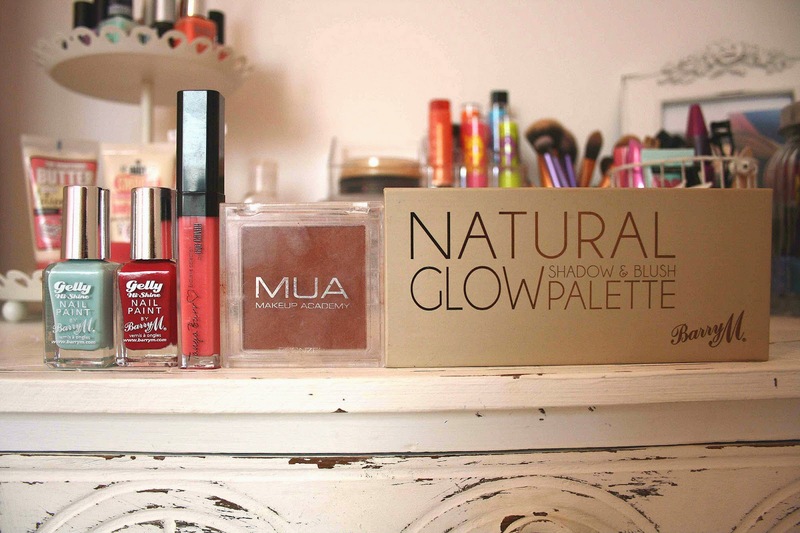 Next is Tanya Burr’s lip gloss in ‘Picnic In The Park’. I also have ‘Vampire Kiss’ from her lip gloss range, and the two I own are GORGEOUS! Picnic In The Park is just the perfect sweet pink colour for summer, and the smell of these lip glosses is super yummy, good enough too eat. I love this lip gloss so much, and would definitely say it’s worth the purchase. So next is a bronzer, that looks quite dirty in the picture I’m sorry about that! I’ve had it for a few months now that’s why. Anyway, its an MUA bronzer. I know people have mixed reviews on MUA, it is very cheap but if I’m honest I love this bronzer. It looks quite dark and harsh, but if you have the right amount on your brush it works perfectly, so I’ve been using this as my go to bronzer this summer. Finally the BarryM Natural Glow Shadow and Blush Palette. Now I have put this in my favourites because the colours are really lovely. However the pigmentation is quite poor. They’re faint, and you need quite a lot on your brush. But if you’re going for a subtle ‘natural’ look then really it does the job. My favourite is the dark brown on the far right, I just blend that into my crease and that turns out quite nice. The palette is a mixture of shimmers and mattes which is also a plus. I haven’t yet tried the blusher but the pink does look like such a lovely colour! So that is it for my July favourites! I’ll try and post more often I promise, please comment what else you’d like too see because that’d help me out so much! Thanks guys.